Are you inspired by the seventies style, then you might want to use bohemian home décor to decorate your house. This home decoration has comeback to be trending once again and it seems a lot of people try to use this style inside their house. By using this style your house will appear calmer and laid back as it is the signature of bohemian style. Moreover with the color and material used in this style, you can see that Bohemian really pretty with a lot of colors. This might be one of the reason why Bohemian style comeback alive once again. 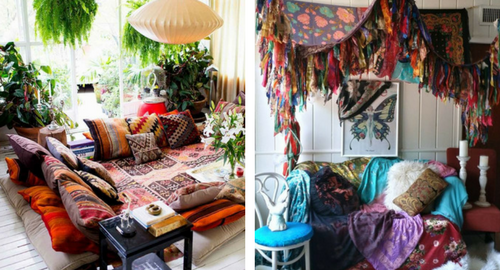 Must Have Bohemian Home Décor for All Rooms? In the bohemian style, you must implement its signature by using colorful items with beautiful pattern. And the easiest way to do it is by using pillow as accent inside your room. By using this pillow as the accent of your room you will be able to hint the boho style in your room especially if you do not want fill the room with bohemian style since it might feel too crowded. Moreover you can add pillows to a lot of room in your house such as living room and bedroom; you might even add the pillow in your patio’s sofa. Bohemian home décor style is praised because of their beautiful textile which filled with unique pattern and very colorful. That is why you must try to add several textiles to your room. There are a lot of ways for you to add those textiles on your room; all you need to do is to use cloth items which suit your room condition. For example you can add bohemian rugs to every room, add tapestry to your bedroom, and many other. Do not forget to just paint the wall with white color to neutralize those colorful textiles. Furthermore by adding textile to your room, you will add more texture which will make the design even richer. As you know bohemian style loves the nature, which is why you must also try to bring the nature inside your house with bohemian home décor. And one way to do it is to add some plants to your indoor area. Of course you must find indoor type plant which could survive with minimum sunlight since you will place it in your room. Then you must try to arrange the plants so it will make your room more beautiful but not get in the way as well. You can add those plants in all room such as dining room, living room, and even bedroom. A lot of people love bohemian style because it has romantic feeling which created by the items added to the room. If you want to get this romantic atmosphere in your house, then you must try to add some bohemian home décor lantern in your room. With the lantern you can create nice ambiance inside your room because bohemian lantern usually have beautiful light design which you can see when you turn off the light and only use the lantern. This surely will make your room appear more romantic so you should have it in your bedroom, dining room or even living room. Another romantic item that you must have is to add canopy. Not only it is romantic but it will also add more texture and color to your room. Try to find canopy with mixed color or a bohemian canopy. But if you could not find that, then you can actually make one yourself by using several bohemian home décor cloth that you find in your local textile shop then just tie and hung it yourself. Usually people will only add canopy to their bedroom, but actually you can add it anywhere including your living room. When you want to apply bohemian style in your house, then you must think about how it will match with your house. Try to use neutral color in your wall and ceiling since most items in boho style are filled with pattern and very colorful. So you would need something that could neutralize those colors so it would not appear too much. However if you really love color, and want to be brave with your home décor then you can also choose one bold color and paint your entire wall with it, but this method might not be suitable for all people. Next is to use a lot of natural material such as cotton, and wooden material. That is why you must try to use wooden material in most items that you own such as sofa or even wooden floor. This will unite all of the bohemian home décor items since most of the color used by bohemian style comes from earthy color, thus it will be better if you also use a lot of earth tone.